-The air elemental, capable of making wind with their mind and extremely fast speeds, gliding and making a force field. -The earth elemental, capable of moving earth and sand with their mind, naturally very strong. -The water elemental, capable of moving water with their mind and freezing it, can breathe underwater.Weaker in the day. -The fire elemental, capable of controlling lava in volcanoes and making/stopping them being dormant. Can make fire with their mind and is stronger in the day. Very rarely, a horse with all the elements is born, but very rarely sometimes it is thousands of years before this elemental is born. When one elemental dies, for example the fire elemental, the second it dies another fire elemental is reborn. Could YOU be an elemental? "Can we go out of the cave now?" Fable groaned. "Not yet Fable." Rose nudged her son closer towards her. "Sleep now." Fable grumbled but fell asleep. A few hours later, Fable awoke from his sleep, he stretched his legs and nickered quietly "Lets go into the main herd place mama, I am sure they miss their lead mare." Rose turned her head to look at the grey tobiano colt. "Yes little one." The grey mare nuzzled her son. "Alright!" Fable shot forward at a very fast gallop. "My, he is fast." Rose thought and trotted after her colt. When they left the cave a few horses trotted up to see how the two were doing and how nice they looked. "Mama, do you have lead mare stuff to do?" Fable asked and Rose nodded "Go play with Glee." She nodded to the dark bay filly who was shooting around like a rocket. "Okay." Fable trotted over and she looked up happily at him "Hiya!" She neighed and Fable looked surprised "Um, Hi, are you Glee?" He asked and she nodded. "Sure am! Nice to meet ya! Wanna race?" She neighed and did a cow hop. "Sure!" 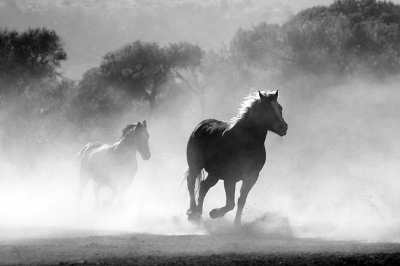 Fable neighed excitedly and they galloped around for a while. A commotion started and the horses moved their foals towards the back of the herd place. "What's going on?" Fable whispered to Glee. "I think there is a horse there." She replied and one of the mares wheeled their head round to face the foals and shushed them. "Sorry!" squeaked Fable and he watched in awe as a huge mustang trotted down from the ledge that was towering over the herd. "That's Drummer." Whispered Glee and Fable gasped as he saw Drummer approach the horse at the entrance to the herd. "What are you doing here?" Demanded Drummer and the horse looked calmly at him, poker facing his fear. "I am a messenger." He explained. "What message do you have to tell us?" "Titan, the former wind elemental, is dead. He died around midnight, ten hours ago." He said and sadness clouded Drummer's eyes. "Did he know him?" Fable whispered and Glee looked at him "I'm not sure, I think so." "Have you told the mountain herd yet? Black Magic had a few foals born recently as did I,the new one could be one of them." "I am going there now." "Right, thank you." Drummer neighed and the messenger nodded in reply and cantered away. Drummers eyes were clouded in thought. And Fable trotted over to his mother. "Rose, what's an elemental?"